VISTA — The invisible intonations of the Tibetan sound bowls perforated the drab environs of the veterans detention unit. Yes, flags of each branch of service hung from one of the walls to add some decor, and on other walls, patriotic paintings added a sense of military brotherhood and color to the unit. 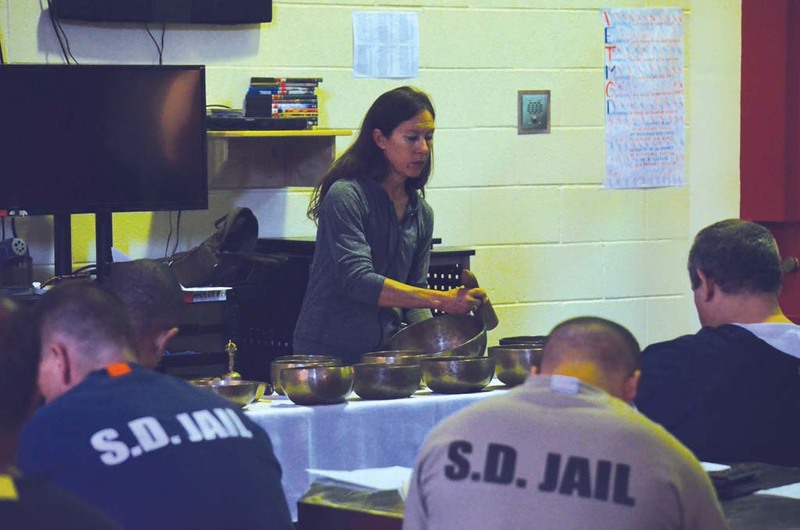 Among the 30 or so inmates serving their time in this particular unit, most were taking in the sounds of the bowls — the healing properties of those intonations perhaps making their way into the invisible wounds of the men there. Diáne Mandle, a certified Tibetan Sound Bowl and Polarity Therapy healer, stood at the front of the unit leading the men in breathing exercises. “Stay with breath,” she said calmly, as they inhaled through the nose and exhaled out the mouth. Some of them rolled their eyes. Some snickered a little at the prospect of taking part in the meditation. But most of them had never meditated or heard the sound bowls before. And then Mandle struck two metallic cymbals together. From there she called on them to conjure up a memory of being a fearless, delighted child. For some, the tones helped to shed the immediate sense of where they were with the relaxation that was setting in. The sound bowls, Mandle explained afterwards, are tuned to the vibrational frequency of “Ohm,” — the sound of creation, the sound of perfection. “And our brain waves…entrain to that vibration, which is why people get relaxed so quickly,” she said. Since last year, Mandle began hosting two sessions every other Thursday at the veterans unit. She said she wasn’t surprised that most of them took up the opportunity to learn more about the meditation. “A lot of them have deep forgiveness issues that come from trauma of being overseas, but also the trauma of coming back and being on drugs, or doing some theft, or domestic violence or whatever they’ve done that got them into jail. “Some of them have PTSD, some of them don’t. But they are all very hungry for this kind of education,” she said. Of the 64 veterans that are currently incarcerated now at the facility, the main goal is for these guys to change the way they think, change the way they live and never come back to jail again, said Glendon Morales, correctional counselor for the Sheriff’s Department and a retired Marine, who spent 24 years in the Corps. The charges that have brought the veterans to the facility range anywhere from DUIs to domestic violence, to drugs, Morales said. “When they first come into jail they always have an attitude, they’re thinking survival,” said Morales. Yet, for the year spanning Nov. 1, 2013 to November 2014, Morales said they’ve only had four veterans return to jail. And only one with a new charge, the others were just violations. Morales credits that to the other nonprofit organizations that help to do for the veterans what the jail can’t. Once they get out there, there are a lot of issues, Morales explained. And none of them take the time to take care of themselves. Mandle is teaching them how to take care of themselves, he said. Since the meditation program began, he said he’s seen a lot of changes not only on the inside, but also from those that have gotten out. He maintains relationships with the veterans that have gotten out, some calling him once a week. He said they are still meditating, still taking the time. While Mandle said she wasn’t surprised by the receptiveness of some of the veterans to the meditation, some began reaching out to her, asking if she could bring in books on other types of meditation, on self-help topics or on how to cope with adversity. Since then, Mandle has been collecting books, trying to build a metaphysical library at the jail for the veterans that are there, and are soon to come, she said. “They’re looking for stuff on meditation, on changing belief systems, on how to focus — things that will help empower them being OK with where they are,” said Mandle. “A lot of these guys hate themselves. All they’re looking at is their weakest link, and this helps them see they’re not their weakest link. They’re much more than that and they can start to move, strengthen that,” Mandle said. Brian James, who wished not to give his last name, has been incarcerated in the veterans unit for almost four months. But the 33-year-old former sonar technician with the Navy said these meditation sessions have helped him to develop better visualization. He practiced silent meditation in the past, and said that once he’s back out, he plans to continue the sound meditation practices he’s learned while here. During the sessions, Mandle asks the veterans to visualize themselves on a high mountain lake. “When she said to visualize a lake and mountains, I could see myself on a lake in a kayak with my kids and it felt good,” he said. Ronald Hyde served as a surgical technician in the Air Force. He had only just arrived at the Vista Detention Facility, but he said he’s participated in sound bowl healing and meditation before in other facilities, including the VA. It helps with the anxieties, Hyde, 54, said. His experiences with other sound healing programs and yoga, he said, have helped him with that. Tibetan people are very spiritual, Hyde said. “They think that everything has a reason to be here. And it does. Everything has a right to live…but I’m from the ‘60s. I believe in peace, love and happiness,” he said. Mandle is still collecting softcover books for the library — books that are good reads and that have a strong message, she explained. Those interested in donating can reach Mandle at soundenergyhealing@gmail.com.